Christopher Keating has announced he will pay $30,000 to anyone who can prove, scientifically, that global warming isn't happening. (If you're thinking of entering, the $30k competition closes at the end of this month. He's got another easier comp, with a prize of $1,000 for the first correct entry.) Christopher Keating is a retired scientist who has written a book on the subject of climate change. The prize of $30,000 will be given to the first person who "can prove, via the scientific method, that man-made global climate change is not occurring". The prize of $1,000 will be given to the first person who "can show there is valid scientific evidence indicating man made global warming is not real. It doesn't have to prove man made global warming is not real, it just needs to be valid scientific evidence against it". Now quite a number of people, like Alec, have decided to enter the $30k competition. However Alec, being the deeply suspicious person that he is, thought it could be what he called a bait and switch. You'll see how his mind works by the following. Ridiculous. There is hardly a skeptic alive who doesn’t think that human activity is causing some climate change, and in particular, some amount of warming. The question is whether one accepts the IPCC’s claim of extreme certainty that the human release of greenhouse gases is responsible for most late 20th century warming, and is on course to cause a dangerous amount of warming over the next century. Skeptics see this as unlikely, or as unsupported by the evidence, but it all comes down to the size of the human warming effect. Moreover, Americans’ certainty that the Earth is warming has increased over the past three years. Currently, of those who think global warming is happening, nearly two in three (62%) say they are either extremely (30%) or very (32%) sure that it is. Three years ago, in May 2011, fewer (54%) were as sure. And over the same three-year period, those who think global warming is not happening have become substantially less sure of their position (from 52% in May 2011, to 41% today). 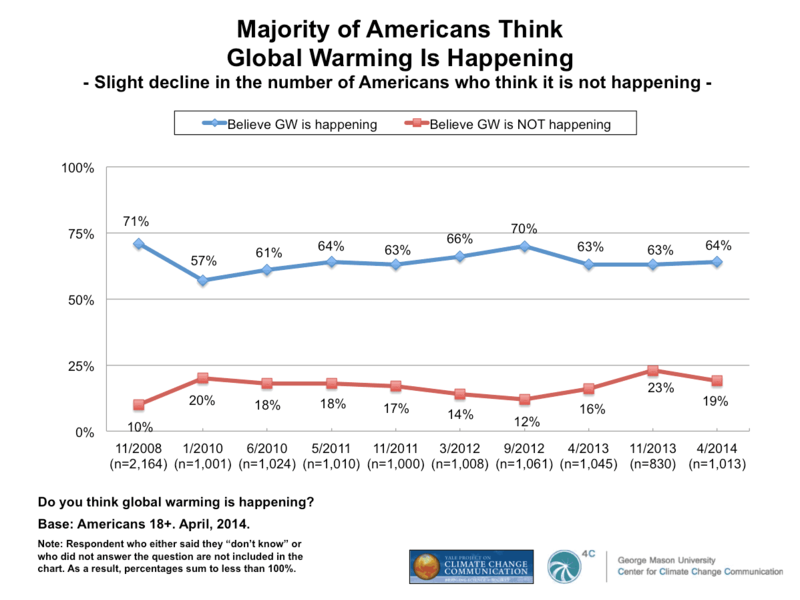 I think there are more deniers in the USA than in most other countries. Certainly a bigger proportion than in Europe. Nevertheless, the above poll suggests that Alec is wrong when he claims that "There is hardly a skeptic alive who doesn’t think that human activity is causing some climate change, and in particular, some amount of warming". 19% is a big number. Does 90% approach a consensus? What about 97%? 90% agreeing is a "lack of consensus"? It's another example of denier weirdness. As you probably know, of the surveyed respondents who actively published climate science research, almost all agreed the temperature is rising (96%) and humans are causing it (97%). It's hard to argue that's not a consensus. It is extremely likely (95-100%) that human influence has been the dominant cause of the observed warming since the mid-20th century. Climate sensitivity is likely in the range 1.5°C to 4.5°C and extremely unlikely (95-100%) less than 1°C. There are all sorts of excuses given by the deniers at WUWT for failing to meet the challenge. One of the more common ones is that they reckon you cannot prove a negative. That's pretty dumb by any standard. I can prove that the sun didn't shine at midnight in my part of the world last night or over the past year. It's easy. I can do it in any number of ways. For example I can use a wide angle camera to photograph the sky at midnight every night of the past year. I can put a light meter outside at midnight and compare it to when the sun is out in the daytime. Or I can show scientifically that at midnight in my part of the world, the earth is oriented in such a way that this region is not in sunlight at midnight and won't be for a very very long time. I expect you could come up with other ways I could prove the negative beyond all reasonable doubt - that the sun doesn't shine at midnight in my part of the world at the present time and won't for a very very long time. Jupiter, Saturn or any of the other planets. So if science deniers wanted to they could surely come up with solid evidence that global warming is not the result of human activity. I mean they could even accept that global warming is largely caused by the increase in atmospheric carbon dioxide but try to prove that the increase in carbon dioxide wasn't the result of burning billions of tonnes of fossil fuels. there is no greenhouse effect. No prizes for guessing. Alec's Part 2 is a complete let-down. Much expectation was generated by Anthony Watts withholding Alec's Part 2 for a day. Everyone was waiting to see his proof, "via the scientific method, that man-made global climate change is not occurring". Well, what a let down. Alec's Part 2 was clogged full with multiple paranoid conspiracy theories (archived here). His main conspiracy theory was that the IPCC is a political organisation not scientific. Which is a load of codswallop. The IPCC is a scientific organisation. Just which of the 195 member countries Alec thinks controls the politics of the IPCC, he didn't say. Does it have the right wing politics of George W Bush or the centrist politics of Barack Obama or the uber-right wing politics of the Republican-dominated US House of Representatives? Perhaps it has the conservative right wing politics of David Cameron or Tony Abbott or Stephen Harper? On the other hand could it be dominated by the politics of China or Saudi Arabia? Alec doesn't say. If late 20th century warming was not caused by CO2 it has to have been caused by something else, like the 80 year grand maximum of solar-magnetic activity that began in the early 1920′s and ended just about when “the pause” began. Which is pretty dumb considering that solar activity peaked in the 1950s, not 2005. Yet 2010 was the hottest year on record. And that's only surface temperature. There are still the oceans that are warming up. Just like his straw man statement above, Alec postulated other "could be's", none of which bear any resemblance to scientific observations. What a shame. Everyone was waiting for the definitive fake sceptic competition entry that would prove once and for all that climate science is a hoax. Well, all they got was the standard fake sceptic Gish Gallop of it "could be" this or it "could be" that. No science at all. Applying the scientific method to the AGW hypothesis clearly determines it to be false. Trying to prove a negative is not science. Oh yes they have. There are those who say the Greenhouse Effect does not exist e.g. the “Slayers”, those who say human activity has contributed nothing to the rise in CO2, those who say it is all the Sun, those who say it is due to natural cycles all mysteriously adding in the same direction, or who say it is the movements of the planets, or that the temperature data has all been faked, and probably more. Some or most of these will turn up on this thread. On the other hand, if you are going to argue that the Greenhouse effect is real, and that the rise in CO2 is (mostly) human caused, but that the net results is less than claimed, then this is a scientifically valid argument, but to prove it you would have to find firm evidence of the relative proportions of human and natural effects – which is of course what a lot of climate science is trying to do. I suspect one problem Keating has it that he has allowed Alarmist/Warmists to define the skeptical position. A very naïve beginner level mistake. July 25, 2014 at 3:30 pmGood article. I generally agree 100% with Alec Rawls. But I don’t think he will ever see a penny from this so-called ‘challenge’. ...The submission effectively disproved both AGW and the idea of a net radiative GHE by demonstrating that the surface temperature of the planet in absence of atmosphere would be far higher than the 255K used by climastrologists. you havent met his challenge. There is no science without measurements. Where does that leave the AGW conjecture? …………….. Nowhere, the basic supposition is incorrect; CO2 will cause global warming, if concentrations in the atmosphere increase by more than the 0.0008% than they already have done! Please explain how Keating has issued a legitimate challenge. Alec, thanks for the kind words and link to the introductory post about my book “Who Turned on the Heat?” However, I haven’t presented a theory. I’ve presented data and an interpretation of that data, all of which lead to the reality that ENSO, as a sunlight-fueled recharge-discharge oscillator, provided a substantial contribution to the global warming we’ve experienced since the mid-1970s–a contribution that is overlooked by mainstream climate science. I illustrated the lack of proof by pointing out temperature does not equal heat. Nor is it convertible to heat using just what is measured in the proxies. I.e. Tree rings don’t measure pressure etc. He really didn’t have a response. Is anyone surprised that one left Dr Keating lost for words? Ideology, ignorance and superstition don't rely on facts and the scientific method. You see that whenever you 'argue' with deniers. That's why all you ever get is is a wallop of gish gallop, misinformation, logical fallacies and ad homs. If there was scientific evidence that it was all due to the sun for example, don't you think that they would be trumpeting it. I also notice that most of the deniers I interact with are incredibly stupid and wilfully ignorant. Instead of taking a bit of effort and time to actually read even the most simplest of information, they instead actively seek out ideological blogs to reinforce their ideology. Climate science is the new version of evolution, and I often see those who reject evolution, also reject climate science. You can't 'see' evolution, like you can't 'see' the greenhouse effect. Both rely on being able to interpret a wide range of 'secondary' data. The closet thing to 'seeing' the greenhouse effect is to look at the earth's radiance. But to many, what they see is just a bunch of funny looking lines. It's just a lot easier to wilfully ignore the data, refuse to investigate it further and just call it a hoax. I laughed out loud when reading Bob's comment. Bob, please take that class on Energy Conservation. Seriously, WTF is a "sunlight-fueled recharge-discharge oscillator"? Also, oscillators don't have a direction to their magnitude, they go up and down or back and forth. Those that have direction have forcings, such as CO2 to the atmosphere. Such a simple point, but Bob is clueless. I love sock-puppet Stealey - all huff and puff and no content. Notice the "solar-magnetic activity"; no mere solar activity for this guy, but solar-magnetic. That's more the sort of thing that can give you super-powers in a lab accident, as may have happened to Alec Rawls. Or again he may be a lab accident. Much remains hidden. And the "sunlight-fueled hocal-pocal discombobulator", just stop it. Only a serious talent could parody these people. A follower of vukcevic perhaps? Not yet but I will make efforts to redress that. It is the JoNova headline that counts, the article itself appears to be a "bait and switch" as she is refering to CAGW, not AGW. I sometimes wonder if by the phrase "cannot prove a negative" the AGW deniers really mean you cannot prove the non-existence of something. It would not surprise mean as AGW deniers do seem confused at the best of times. I think some deniers are confused by the notion of testing null hypotheses. A null hypothesis can be rejected or one can fail to reject it. That's different to "proving a negative". Or perhaps deniers are confused by the fact that absence of evidence is not *necessarily* evidence of absence. But it does depend on whether there is evidence and if so, its nature. There are lots of articles about this weird fallacy of not being able to prove a negative. Some of them refer to proving that a unicorn doesn't live in your garage or proving that there isn't a fire-breathing dragon in your basement. Both of those negatives would be easy to prove or disprove, simply by observation (even or especially if you believed there were such things as unicorns and fire-breathing dragons). If the rain gauge is bone dry, and evidence shows it is working, then I would be justified in treating the absence of water in the rain gauge as evidence that it hasn't rained. Particularly if I stood by the window all day and saw not a sign of rain or a wisp of cloud. On the other hand, if I made a bald statement about the lack of rain based on glancing at the BOM radar map, without seeing what happened earlier in the day, then the absence of evidence wouldn't be sufficient to show it did or didn't rain. I'd need more evidence to prove the absence. A phone call to my next-door neighbours would get some evidence. If they said it rained then that would be that. If they said it didn't I'd probably ask for more evidence because they could have missed noticing a short shower. In reality, the deniers wails are only because they have no evidence that the greenhouse effect is not real or that burning fossil fuels doesn't produce a greenhouse gas. On the contrary, the evidence all points to the fact that deniers are woefully wrong about global warming. If a proposition has a necessary consequence and that consequence is shown not to pertain, the proposition is falsified. If A implies B and not-B then not-A. All that's needed is a necessary consequence of AGW which can be (and is) proven not to pertain. I say "all" but I'm coming up empty on that myself. I tried to think of an argument about the theory of AGW that would at least get me the $1,000 from Christopher Keating, but I came up empty as well. The theory of AGW is robust. I suspect the honest contrarians are aware of this, and are now "shifting the goal posts" to projections of catastrophic AGW ie who is afraid of a little warming?